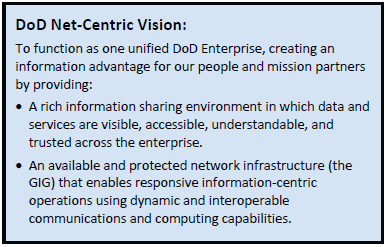 The DIEA is part of the organizing construct of the DoD Information Enterprise and DoD Enterprise Architecture. Data and Services Deployment (DSD): Decouple data and services from the applications and systems that provide them, allowing them to be visible, accessible, understandable and trusted. 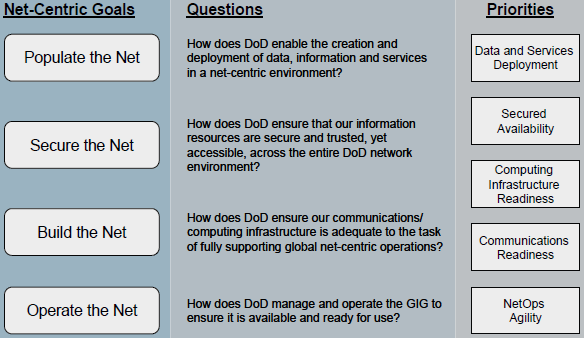 Lay the foundation for moving the DoD to a Service-Oriented Architecture (SOA). 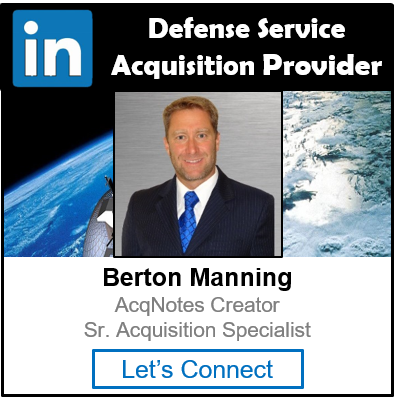 Secured Availability (SA): Ensure data and services are secured and trusted across DoD. Allow users to discover data and services and access them based on their authorization. Computing Infrastructure Readiness (CIR): Provide the necessary computing infrastructure and related services to allow the DoD to dynamically respond to computing needs and to balance loads across the infrastructure. Communications Readiness (CR): Ensure that an evolvable transport infrastructure is in place that provides adequate bandwidth and end-to-end, seamless net-centric communications capability across all GIG assets. NetOps Agility (NOA): Enable the continuous ability to easily access, manipulate, manage and share any information, from any location at any time. DIEA Background: Title 40 U.S.C. Section 1425: Develop, maintain, and facilitate the implementation of a sound and integrated information technology architecture for the executive agency.